Installing unidesk is real easy. After signing up for a trial, Unidesk provides you with a download link for a zip file. The zip file contains two OVF files which must be loaded into your vSphere environment, preferably onto a HA cluster to make sure Disaster Recovery is in place. First the Management Appliance OVF: After implementing the ovf file, the Management application can be started. 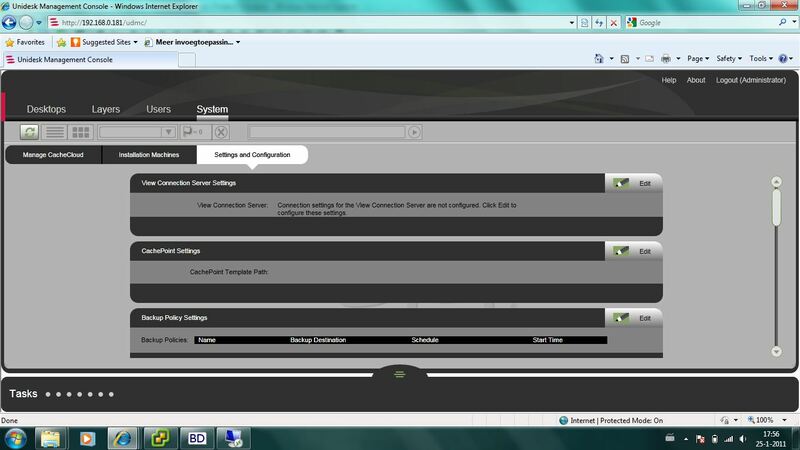 Configuration can be done through a webinterface. After configuring the webinterface you can log into the management interface which uses Microsoft Silverlight and is easy to use. The second OVF is the Cachepoint Appliance. Unidesk best practice is to supply each host (serving desktops) with a seperate Cachepoint, which holds the layers (OS, Application and Personalization layers) needed within Unidesk. To be able to roll out these Cachepoint’s quickly it’s needed to convert the first CachePoint to a template. Once the convertion is done you can deploy the first Cachepoint from within the management appliance. The first Cachpoint will serve as Master CachePoint Appliance. When extra CachePoint appliances are added, they’ll sync the layers of the master CachePoint. Both the management interface and the Cachepoint get a DHCP address, by default, which can/must be changed real easy through the web interface. Once this is done everything can be easily managed through the management appliance. 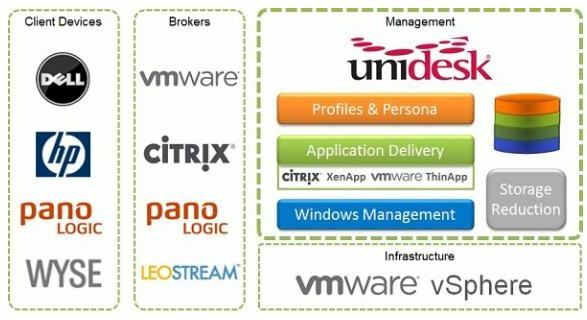 Most of the connection brokers are supported (VMware View 4.x, Citrix XenDesktop 4/5, Pano Logic, Leostream, Microsoft…) Everything is well documented and if your unable to find the answer the Unidesk team is around to help you quick and professional. Be sure to see some more details on Unidesk at their site http://www.unidesk.com Just see for yourself, a POC is the least you should try 😉 Next post will be about getting a golden image into the unidesk environment. VDI isn’t perfect. Add Unidesk and it can be.? The last couple of days I’ve been installing and playing around with the Unidesk (twitter: @UnideskCorp) software. First of all I must thank some people at Unidesk for getting me the software so quick and giving me the opportunity for the trial they provided me. I want to thank Ron Oglesby (twitter: @RonOglesby) in special for being advising and helping via twitter. It’s great to see that everyone within the Unidesk Corporation is investing so much time and effort in their product. It should be an example for some other companies. The Unidesk slogan is: VDI isn’t Perfect. Add Unidesk and it can be. User Experience: Sustain all user persona – profile settings, directories, data, user-installed applications, plugins, SIDs, GUIDs, and more – through desktop logouts, reboots, and patches. You’ll eliminate the need for profile management, delight your end users, and be able to expand VDI to more use cases. High Cost: Use up to 70% less storage to reduce VDI implementation costs. Unlike cloning and de-duplication solutions, Unidesk offers massive storage savings without losing any user personalization. Management Complexity: Simplify O/S management and deliver any application – even that application virtualization can’t. With Unidesk, you can provision and patch all desktops from a single Windows XP or Windows 7 image and single images of all your applications – even custom-built apps, VMware ThinApps, and apps with system services and boot-time drivers such as antivirus, Adobe Acrobat, and printers. When implementing a VDI environment (even if it’s just a POC) several difficulties arise to doom the project. What will be the impact on storage, which rights will/does a user need , how will applications be delivered, what about printers, how many golden images do we need, what about the user profiles and so on…. Unidesk claims they’ve found a way for solving all these problems with just one tool, theirs. Unidesk states that they are achieving this solution by using a layering technology they call the Unidesk Composite virtualization and the Unidesk Cachecloud. The word independent is an important one, because all layers can be independently updated or upgraded. This means that it’s possible to go from windows XP to windows 7 without affecting the application and personalization layer. 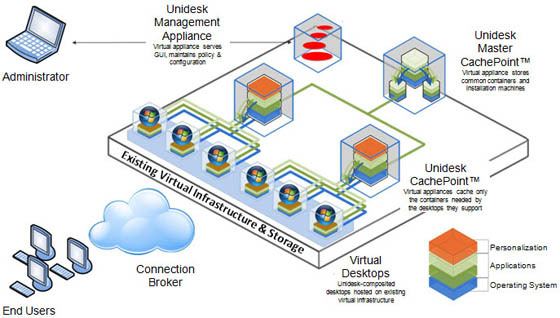 The following picture illustrates Unidesk composite virtualization (click to enlarge). The Operating System layer holds , preferably, a clean copy of Microsoft Windows. It could include applications that should be available to all users, but best practice is to use a clean copy of Microsoft Windows. On top of the OS layer you can add application layers; all applications can be added separately to give every user exactly those apllications they need. 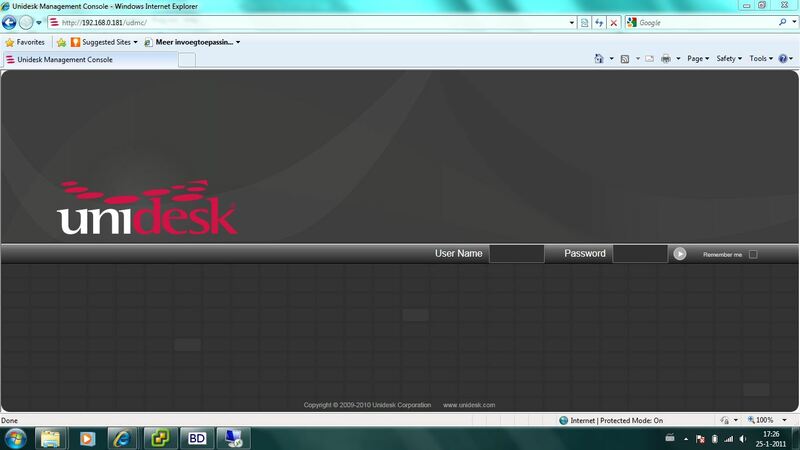 Great thing about Unidesk is the ability to even use applications that need device drivers or boot-time services. This means that even a virus scanner can be packaged. The personalization layer is the top layer. This layer is always a pain in the … Users want total freedom (installing whatever application they want, setting a picture of their kids as background…), and IT wants total control, for they know all these self-installed applications and stuff are the things that destroy a desktop. Well Unidesk solves this (BIG) problem in their personalization layer. How? By separating the user state from user data within the layers. The Unidesk technology is aware of all user changes, even the difference between User data, Applications and settings by using the Composite Virtualization layering. By snapshotting all of these (at a configurable rate), IT can roll back to any given state without losing data, or self-installed applications. If a user installs an application and after installation Excel isn’t able to start, IT can just roll back to a snapshot that was created before the installation. Keeping all data intact and the user happy. Because of a small footprint this will only take a small amount of time, saving IT (and the user) lots of money. As you can see all administrator actions are done through a separate Management Appliance which is easy to use, and uses Microsoft Silverlight. It’s recommended to make sure of a secure disaster recovery strategy for both the Management Appliance and the Master Cachepoint. This can be accomplished by using VMware High Availability and a good backup environment. In my following blogs I’ll give you an introduction to my journey on installing Unidesk, and a further breakdown of the technology. For much more information and the ability to a trial I advise you to visit the Unidesk Site: http://www.unidesk.com it’s really worth your visit!